Get smooth, balanced sound with Harman Kardon, plus Dolby. The Acer Aspire Z3-605 comes with Harman Kardon speakers and Dolby Home Theater v4, meaning tinny sound, weak volume, and buzzing and rattling is replaced with accurate, honest sound which is reproduced just as heard in the recording studio. Easily switch between listening modes for difference scenarios, hear dialogs clearly while watching noisy live reports and smoothly enjoy sound effects without sudden volume increases in movies with Harman Kardon and Dolby. Inspired by Aspire M3; frequently-used I/O ports are grouped in a capsule-shape area in the front to offer easier access to the OSD button, SD Card reader, USB 3.0 and 2-in-1 combo audio jack. This eliminates tangled cords from the back or side ports. A complimentary anti-dust cover is used to protect the handy front I/O from dust when it's not in use. Optimised Sound -- Honest, well-tuned audio delivered by Harman Kardon speakers and Dolby Home Theater v4. Easier Access -- Control Windows 8 from a distance using hand gestures and a handy front I/O offers quick access to most frequently-used ports. Ultra HD -- Full HD, IPS display and adjustable HD webcam (up to 20°). 10-point Multi-touch LCD -- More fun at your fingertips. Windows 8 -- Explore the touch interface with apps from Windows Store. HDMI-in -- Connect with HD media devices for much more high-quality fun. Suspend actions in Windows 8 by waving. Select applications in Windows 8 by grabbing. 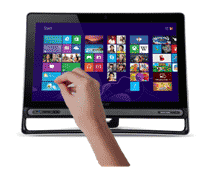 The Acer Aspire Z3-605 offers more than just a touchscreen -- you can control Windows 8 without touching anything. Use your hands to intuitively interact with Windows 8 Metro UI and App, remotely control your mouse in desktop mode and switch in between. There are two modes: Desktop Mode allows you to increase mobility and stay productive with your hand and wireless keyboard. Meanwhile, Metro Mode allows you to select and move any item, you can also zoom in and out for a better view. Simply place you hand up to 20-30cm away in Windows 8 Metro Mode, or 50-150cm away in Windows 8 Desktop Mode, to begin hand tracking. Then you can select applications with a grabbing gesture, and suspend actions by simply waving. 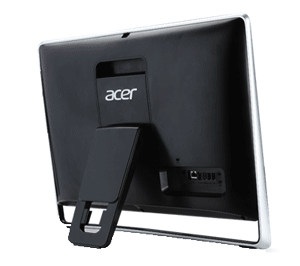 The Acer Aspire Z3-605 comes with a tiltable stand. The Full HD, IPS display offers consistent views, colours and brightness from whichever angle you choose -- up to 178° horizontal/vertical with the tiltable stand. Watch with friends or family, and you can all enjoy the same view at once. 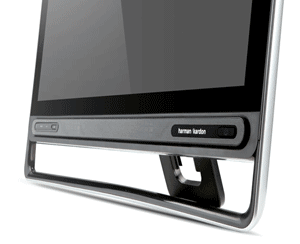 The 23-inch 1080p screen offers 1920 x 1080 resolution with mercury-free LED backlit LCD. You can also control Windows 8 with your fingertips, thanks to the 10-point multi-touch LCD. 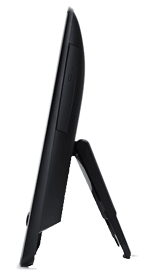 This adjustable HD webcam enables both adults and children to comfortably find their ideal positions to communicate. The HD webcam can adjust up to 20°, so it supports more scenarios even if you're sitting, standing or lying down. The Acer Aspire Z3-605 features HDMI, gigabit Ethernet and Wi-Fi connection. The 10/100/1000 gigabit Ethernet provides connectivity via a high-speed wired connection, while 802.11 Wi-Fi allows you to enjoy fast internet speed to instantly enjoy online multimedia without being limited by location. There is also a HDMI-input so you can connect your HD media devices for much more high-quality fun.